Somewhere between reloading ROMs, going through new phones and adding contacts in last name, first name versus first name, last name order we all get a lot of duplicate contacts. In the past I’ve cleaned this by using software on my PC. 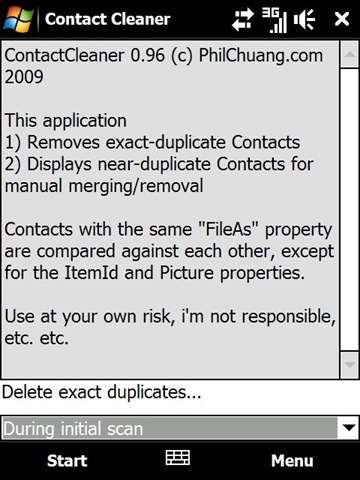 Thanks to zaijian of XDA we now have Contact Cleaner which is a simple way to remove duplicate contacts. If there’s an exact match you can set it to automatically remove the dupe (I had 80 exact matches). It also tells you about near matches (like two of the same contact but with slightly different info) but I found this feature a little more confusing to use but it’s still a good tool to see where my near dupes are. All in all, it’s a simple app to use and it works. For anyone that used DupeDeDupe for this in the past I’d love to have your opinion on which is better. Contact Cleaner can be downloaded here. Thanks again to zaijian especially for cleaning out 15% of my contacts. Play Xtrakt (And Other Games) With The GSen!! !